From the origin of the gods to the inhabitants of the darkest infernal pit, Princes of Darkness: Book of the Damned Vol 1 is an unflinching look at the methods, motivations, and goals of Asmodeus, the archdevils, and the entire hierarchy of Hell. Whether you're planning to storm the gates of Avernus or trade in the exotic and immoral markets of Dis, or simply want to add a splash of diabolical flavour to a standard campaign, this book is full of delicious temptations worthy of Faust himself. A layer-by-layer description of Hell and its rulers. The hierarchy of Hell, and how devils are promoted. The role and duties of each kind of devil, including the infernal dukes. Devil talismans, true names, and their uses. New Hell-themed spells, magic items, and artifacts. The diabolist prestige class, complete with imp companion. Five new kinds of devils, from the blaspheming apostate devil to the relentless levaloch. 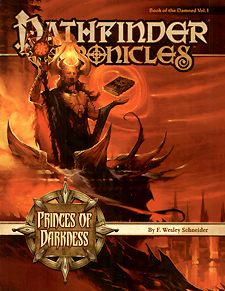 This stand-alone book can also complement the material found in the Council of Thieves Adventure Path, Pathfinder Chronicles: The Great Beyond, and Pathfinder Companion: Cheliax, Empire of Devils.